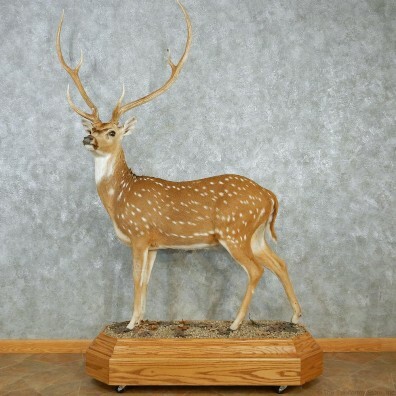 This is an absolutely stunning life-size Axis Deer taxidermy mount. It is posed in a standing position, set into a custom made wooden habitat base. The hide and hair quality are outstanding, but the antlers steal the show. With a SCI Gold Medal Score of 159 7/8", this Axis's set of antlers rank #55 in the world. 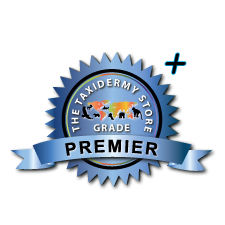 The masterful craftsmanship is the icing on the cake, earning this item our coveted Premier Plus™ overall quality rating. All applicable measurements and dimensions are provided to help ensure this item will fit within your intended space, as well as meet expectations regarding the item's featured attribute sizes, scores, etc.